Two wheels, an engine and a frame. All you need to travel, with no superfluous superstructure. This is the spirit of the Stone Touring, a bike which believes in the beauty of simplicity. Streamlined no-frills lines, minimalist style, classical design, clean silent shaft drive and trendy colours are the main characteristics of the youngest in the great California family. Innate elegance, made up of spontaneity and naturalness, a personality to slip on like a suit or a comfortable pair of timeless jeans. The 90� V-Twin is a visible sign of tradition, but beneath its unmistakeable form it conceals innovations such as the hydraulic tappet system, more efficient and silent. Emissions are also reduced to a minimum, because the three-way catalytic converter with Lambda sensor guarantees respect for the environment. The high tensile steel frame is ultra-strong and its rigidity provides a more sensitive and responsive ride. The hydraulic telescopic front fork with its massive 45 mm inners contributes to the qualities of the front which behaves perfectly when going into bends and maintains direction impeccably on straights. 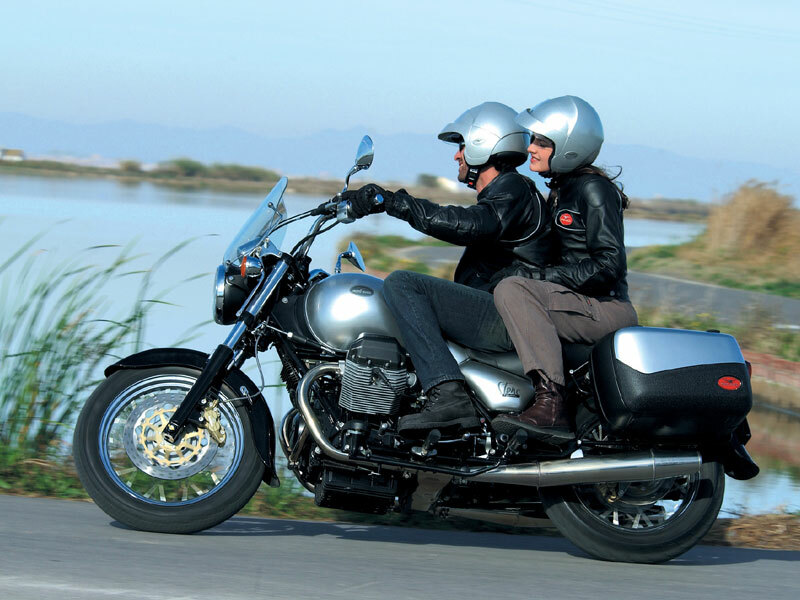 The comfort of the rider and passenger is guaranteed by the fully adjustable double rear shock absorber. On longer trips, protection is provided by the large windshield fitted as standard, while all the indispensable can be packed away in the exclusive set of travel bags. 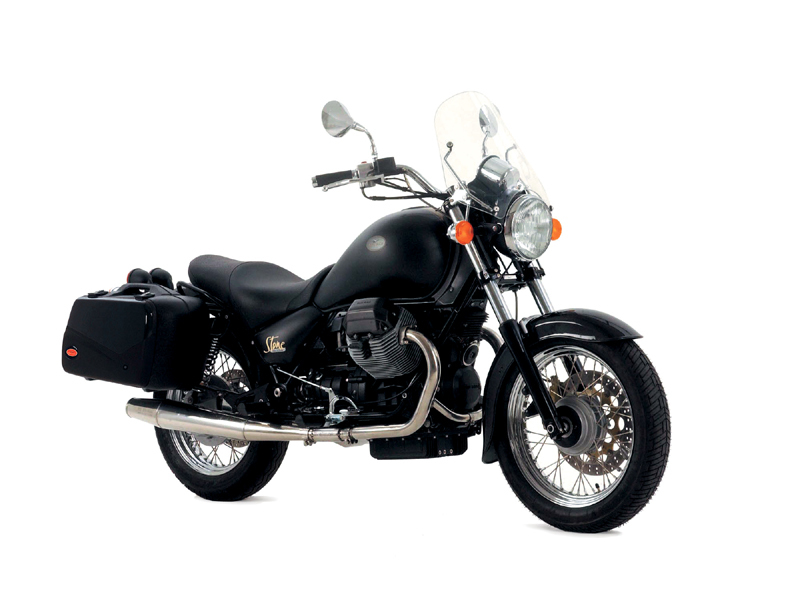 The brilliant chrome, interminable exhausts and round headlight are a tribute to the purest custom fantasy, reworked and corrected by the creativity and technology of Moto Guzzi. Valve timing - Intake open 21� B.T.D.C., Intake close 47� A.B.D.C., Exhaust open 51� B.B.D.C. Front rim - 2.50" x 18"
Rear rim - 3.50" x 17"
Front tyre - 110/90 VB 18"
Rear tyre - 140/80 VB 17"